"Lots of people are upset about the 4:3 aspect ratio of the iPad so Apple is rolling out one with a 16:9 screen in a few months. They're calling it the Max-iPad." Okay, giggles at its horrible name aside, plenty of people are wondering if the iPad is already set to be a bomb for the House of Jobs. Putting it all into perspective is Geoff Gentry: good friend and techno-ubergeek whose opinion on all matters gadget I have long held in great esteem. 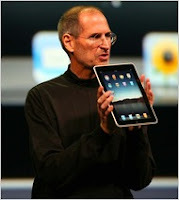 First of all as "magical" and "revolutionary" as the iPad is, it is 1st generation technology. With Apple that means it will get better quickly. Here are my thoughts on the new product. The Name: Yes the word pod was out there before Apple added the "i" and made it a household word. But pad on the other hand is used for so many things and is hard to add a new definition. Did the naming folks at Apple not do any research with people or online? People automatically started making feminine hygiene jokes about it. While the name is direct, simple (two syllables) and close to the iPod it is lacking. I personally think iSlate would have been a better choice. The Hardware: The size and astetic design are good but it is lacking in several ways. First, I know they were trying to keep the ports down to a minimum, but having to use an adapter for USB or one for SD is clunky. I look at it and I think large iPod Touch. It lacks a camera (or even better 2). It needs work on the hardware side that I hope will be addressed. Hit here for more of Geoff's take on Apple's latest igizmo.